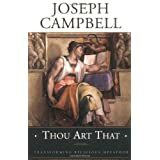 Thou Art That: Transforming Religious Metaphor ReviewTHOU ART THAT is the first volume in THE COLLECTED WORKS OF JOSEPH CAMPBELL which contains materials gathered from previously uncollected essays, letters, diaries, articles and lectures. As such it presents a broad sampling of Campbell's work on mythology and the Western religions. Campbell believes that the stories in the Bible should be read metaphorically. By interpreting events historically institutional religions create a problem. When people realize that the events probably did not take place, then the power of the message is diminished. Examples of such events are the Fall of Adam and Eve in the Garden of Eden and the Exodus from Egypt. A fairly thorough discussion is introduced in Chapter VI of Judo-Christian symbols such as the Virgin Birth, Judas and the Flight into Egypt. Here we see why Campbell is so much admired for the breadth of his knowledge of mythology and his ability to bring this learning to bear on Jewish and Christian origins. In one of the more interesting parts of the book Campbell describes the basic differences between the world religions of creed which are Buddhism, Christianity and Islam and the leading ethnic religions of birth which are Hinduism, Judaism and Shintoism. Often Campbell points out that our ideas of the universe are being reordered by our experience in space. There are no horizons in space causing many people to retreat into fundamentalism. Want to learn more information about Thou Art That: Transforming Religious Metaphor?